Turbines on Heifer Hill that are part of the Bull Hill Wind Project put up by First Wind in Township 16 in this Feb. 12, 2013, file photo. By comparison, as estimated in the Maine Renewable Energy Association white paper, Maine wind power generated 27.8 percent of its nameplate capacity to offset an estimated 490,000 tons of CO2. That’s about a 1 percent offset. No wonder the Maine Renewable Energy Association chose to use a theoretical analogy instead of the real but puny 1 percent figure. — Maine and New England already have lower emissions from electricity generation compared with the nation. — Because of the planned retirement of two large coal plants in New England, there will be fewer emissions for wind power to offset in 2020 than in 2013 because wind will be displacing power generation from a less polluting system. — The Maine Renewable Energy Association paper estimates wind power will offset about 2 million tons of CO2 by 2020 because of an increased number of wind projects and more efficient turbines. But there will be lower system emissions overall because of cleaner and more efficient natural gas electricity generators replacing coal and oil. At best estimates, wind power in Maine may never offset more than 5 percent of annual emissions from other power generators. — Increasing the number of wind projects could increase inefficient ramping and cycling of the standby generators compensate for wind’s often rapid and sizable swings in output, thus eroding some of the emissions-offset benefit of wind. — Wind speeds often are at their lowest levels during summer and cold snaps, when electricity demand is highest. Other power generators always will be needed to ensure demand for cooling and heating is met and to avoid black- and brownouts when the grid is under stress from sudden changes in power supply. 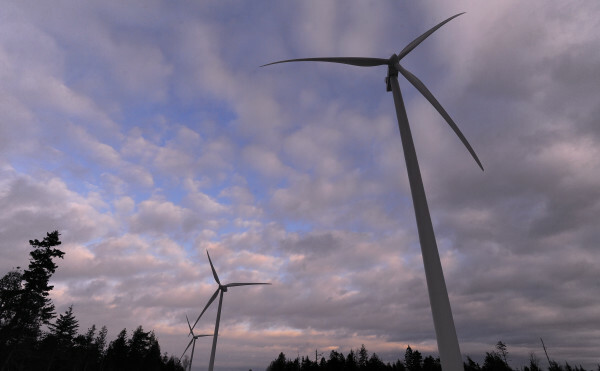 — Electricity from Maine’s remote wind projects may be curtailed to prevent overloading the fragile transmission lines not designed for large amounts of power. — Electricity from Maine’s wind power also may be curtailed when electricity demand is low — at night, for example — reducing the emissions-offset benefit further. — As wind turbines degrade because of normal wear and tear, they become less productive, lowering the emissions-offset benefit. Life expectancy for a wind turbine is about 20 years. Touting a theoretical analogy is a ploy by the Maine Renewable Energy Association to distract the public from the pertinent facts about wind power generation. It appears designed to make Maine wind projects appear as though they are making a big difference in reducing CO2 when they aren’t and may never. The amount of land needed for a multi-turbine wind project is more than that of a natural gas power plant that predictably, reliably and less expensively provides electricity near population centers, where and when it is needed. Paula Moore is a retired assistant professor in the University of Maine School of Education.